Home » Other Games » Pick Me Up Game: How-to Get Money & Cars Fast! We're taking a look at the best ways to get cash and cars in the mobile game Pick Me Up! Our How-to Get Money & Cars Fast in Pick Me Up Guide will walk you through what you need to know to gather up cash and get some sweet new automobiles for this free-to-play mobile game! The best way to get money is to just play the game! Completing each level grants you anywhere from 60 - 200+ cash. This is mostly random based on your fares, and the amount of people you drop off. The later you get into the game, the more fares you'll get and the more money you'll get per level. At the end of the level, you can watch an ad to collect double the cash! This is worthwhile as long as you got something over around 100 cash. Each fare you collect appears to be random as how much is given to you. It doesn't matter how fast or slow you complete it, so trying to complete things in record time is not worth it (although it's a lot more fun). If you care about completing levels and gaining money, then slow and steady is the best option. If you don't want to play your way to money, you can kind of passively gain 100 cash by watching 30 second ads. You can do this about 10 - 15 times a day, and you get 100 cash for each 30 - 45 second ad you watch. You can just tap these and set your device aside and do something else while it plays. The VIP Access option is a good one if you can remember to cancel it after the three day free trial. It gives you 200% Cash Earned and a $250 Daily Bonus. Only do this if you are for sure going to remember to cancel it, because it charges you $5.99 a week afterwards and it is definitely not worth that cost. The first thing to know about cars in this game is that they make no difference in terms of gameplay. They aren't faster than any other car, and they don't stop better than other cars. These are purely cosmetic, and they don't make you anymore money than normal cars. There are a few different ways to get cars. One is with cash, two is by watching ads, three is by following the creator on Instagram, and four is through the VIP Access. The fastest one is going to be by watching ads, there's currently nine cars you can unlock this way. Each car requires you to watch four ads each. You need to click on the particular car you want to unlock, and it will open up an ad. Watch four of these and that car will unlock! To unlock a car with cash, you need to have 1,000 cash to your name in-game. 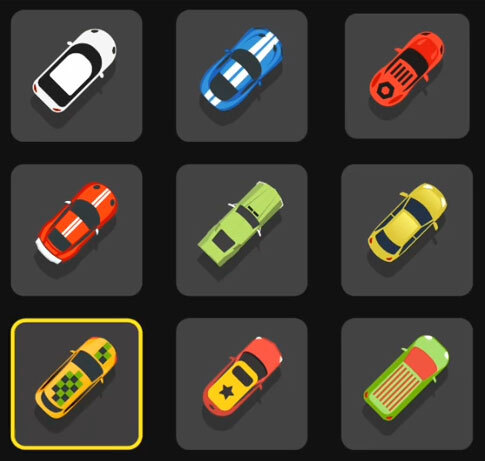 Once you do, you can press the "Unlock Random" button and you will be given one of the 18 currently available cars in the game. The car to be unlocked will be one you don't currently already own. If you do the VIP Access way, it's the same as mentioned in the money section. You can get a three free day trial, and the cars you get are likely limited to as long as you have VIP Access enabled. This is not worth the amount of money it costs per week, so make sure to cancel it if you use this method after the trial is over. When you tap the screen the car should move, when you let go the car will stop or slow down. It doesn’t really come to an exact full stop, so you have let go early.